Disclaimer: Eating certain wild plants can be deadly!! Be certain to consult a professional (or a really good field guide) in order to positively identify this plant before trying this for yourself. The owners of this site will not be held responsible for any lapses in judgment or stupidity when handling or consuming wild plants. Japanese Knotweed (Fallopia japonica) is one of those plants you’ve probably seen a hundred times but haven’t realized it. A native to southeast Asia, it was introduced to the United States in the late 1800s as an ornamental and has since become one of the most invasive plants in the United States, quickly spreading across to more than 40 of the 50 states. It’s root system is so invasive and strong that it can damage foundations, buildings, flood defenses, roads and so on. Despite its bad rap, Japanese Knotweed is a great source of food and medicine and one of my favorite wild edibles in the early Spring. And since it is an invasive species, you don’t feel bad about over-harvesting it. In this post I’ll explain how to identify and harvest Japanese Knotweed and how to make a simple but delicious recipe from your foraging. The problem with Japanese Knotweed is that once you typically notice it, it is usually too late to harvest for food. In early spring, it starts out as a humble shoot that quickly grows (over an inch a day!) into a mature plant reaching upwards of 10 feet high. Although the time to eat it is in the early spring before it begins to turn woody (under 12 inches), you’ll want to be able to identify it during its later stages of growth as well so that the next year you can return in the early spring and harvest it. 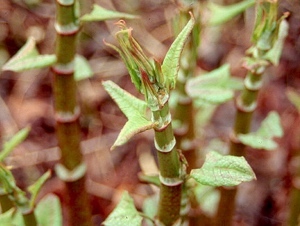 In the early spring red/purple mottled green shoots appear from the ground and grow rapidly forming canes. 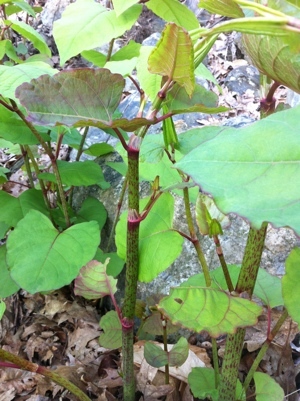 This is the ideal time to harvest the Japanese Knotweed shoots. You’re looking for 6 inches or less. Late spring shoots with initial branching. You can still harvest the plant at this point as long as it is under a foot. At this stage you’ll need to peel them before consuming, since the outside has begun to get more fibrous. 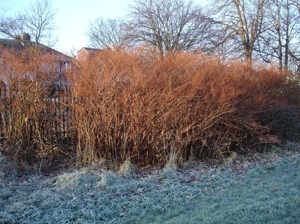 Here’s a good example of how the knotweed comes to form what looks like a large shrub. (Image courtesy of Phlorum.com) Shield shaped leaves that are aligned in an alternate pattern. In the late summer you’ll also begin to see the flower growth. During late fall and winter the knotweed’s energy will begin to travel back into the root system in preparation for the winter time. During this time the leaves fall and the stems die and turn brown. The stems (canes) typically stand during the winter which can serve as a good indication of next year’s growth. Since it grows in colonies, the winter skeletons are easy to identify from afar. While you can eat Japanese Knotweed raw (it is tart and crispy and tastes very similar to rhubarb), ideally you’ll want to cook it. Since it tastes very similar to rhubarb, you can use Japanese Knotweed in any dish that calls for rhubarb – my favorite being strawberry knotweed pie…yumm. 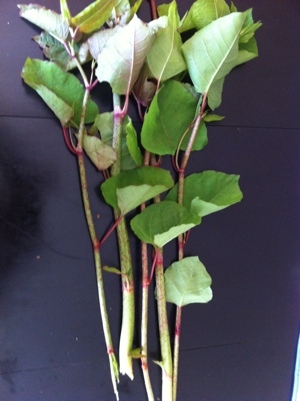 Step 1: Gather your harvested knotweed and remove any leaves and stems. 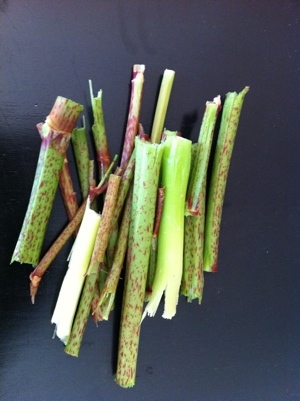 Step 2: Chop the knotweed into a small enough size to fit into your cooking pot and peel those shoots which have begun to form leaves (these will have already begun to turn stringy). 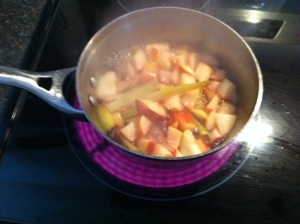 Step 3: Throw the knotweed and chopped apples into a pot and pour apple juice on top, bring to a boil and begin to simmer. 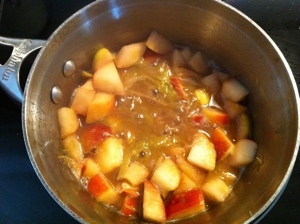 Step 4: Simmer for about 20 minutes or until soft. You will notice that the knotweed seems to melt into a thick, sauce-like consistency. 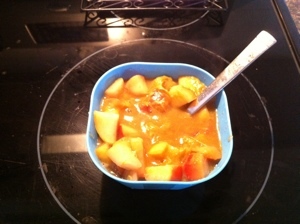 Step 5: Once the knotweed turns to a sauce-like consistency, serve and eat! Japanese Knotweed provides an excellent source of vitamin A and vitamin C. It also provides potassium, phosphorus, zinc, and manganese. Japanese Knotweed is also an excellent source of resveratrol, the same substance in the skin of grapes and in red wine that reduces bad cholesterol and lowers the risk of heart attacks. 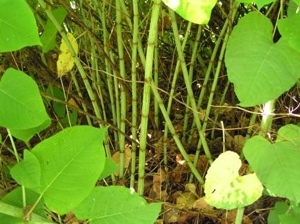 According to master herbalist, Stephen H. Buhner, Japanese Knotweed is very effective when it comes to treating and preventing Lyme’s disease. As an anti-inflammatory, it also helps the immune system to combat various infections, relieves symptoms of arthritis and can protect the body against neurotoxin damage. I presume since it grows in 40 of the 50 states that it grows in Virginia. However, I cannot remember ever seeing it. Am I correct that it is available here in Virginia? Thanks for all your GREAT information! Knotweed definitely grows in Virginia. It is more prevalent inland than near the coastal areas so keep you eyes out for it. Great page I was looking for info like this. I post a video on Youtube asking for some help on the plant ID. Great video Mike. That’s definitely Japanese Knotweed. 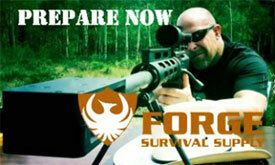 Be sure to try it out in the early Spring. this plant species has the ability to regenerate itself from any part (leaves/ stems). In picking this plant you could accidentally be spreading and invasive species and harming the natural environment. if any part of plant is lost b/t the field and eating it it could start a new population of Japanese knotweed. i dont mean go all environmentalist on you, i just thought you might want to know. No, you’re absolutely correct. I’ll be sure to update the article to include a warning about that. I’m if the leaves of the full-grown plant are edible in a salad? I can’t seem to find any information on them, all of the information I see online states using only the young shoots. Where can I purchase a few Japanese knotweed rhizomes? You’re absolutely right. However since it is here and available we should definitely make use of it. Absolute care needs to be taken that what you gather you use or like you said you can further exacerbate the aggressive nature of this plant. I have knotweed. Boys do I ever have knotweed! However I am of the sort if you can’t beat it..Eat it. Thanks for the info. However, I have a question. I have some just as described here with the white flowers as well as another very same plant, but it gets red flowers in the fall. It is a different variety? Just curious if you or anyone knows info about this? 1) This may be against the law in certain areas. 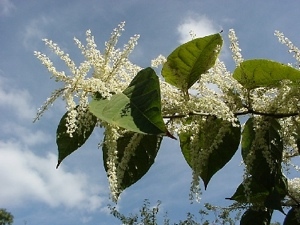 In the UK, for example, you need a specific license to remove Japanese Knotweed from a site. This is for good reason – Japanese Knotweed is highly invasive and even just the tiniest bit on the tread of your boot can spread it to a new location. 2) I am concerned after seeing Knotweed treated with high levels of pesticide. You might, unwittingly, go and eat some that has just been blasted with the stuff a few days ago. This probably isn’t good. Then again, it could conceivably be a similar dose to the standard dose than your Roundup Ready “food” served up in the US. Despite both of these, a friend once treated me to some Japanese Knotweed wine that he had brewed himself. It was fantastic, and washed down our wild mushroom omelette beautifully! Herbicides (not pesticides!) are often sprayed on stands of this invasive weed so don’t collect from stands along roadside or utility right-of-ways, abundant as they may be. This weed often propagates along streams and rivers where herbicde use would not be allowed so that is a pretty safe place to collect. Just don’t add to the invasion by letting plant scraps fall! The word is in the first sentence, “Fallopia japonica”. I have this growing all over my hill side invading everything. How can I kill it out in some places, I would leave it over by the fence line but it is in my flower beds. Help. Have you eaten the seeds, what did they taste like. Thank you we have this growing in our garden and had no idea what it was, then magically found this and now I now. Glad to know that this is a healthy plant not just another weed like we had heard. Cholesterol isn’t all bad. It’s an essential fat that provides support in the membranes of our bodies’ cells. Some cholesterol comes from diet and some is made by the liver. Cholesterol can’t dissolve in blood, so transport proteins carry it where it needs to go. These carriers are called lipoproteins, and LDL (low-density lipoprotein) is one member of the lipoprotein family…..-. Thanks for a great information source. you provide. It’s nice to come across a blog every once in a while that isn’t the same out of date rehashed information. Hi to every body, it’s my first pay a quick visit of this website; this website contains remarkable and truly fine material in favor of visitors. I’m not convinced that a Japanese Knotweed leaf dropped on the ground has the ability to regenerate. The same would hold true for the stem. The root system is a different thing. It does regenerate. But most knotweed patches extend their range with human help. 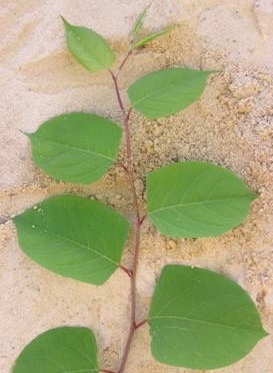 The next time the road crew uses state or federal highway dollars to make another roadside ditch…”make work projects,” in other words, take note if they disturb a knotweed patch. If so, you’ll eventually see a long ditch filled with knotweed. But it’s not the plant’s fault. I don’t mean to insult anyone by my skepticism. I do plan on trying to see if I can make my own knotweed patch spread by leaves or shoot cuttings. I have had difficulty in getting knotweed to grow in the gravelly, moist soil where I planted it. 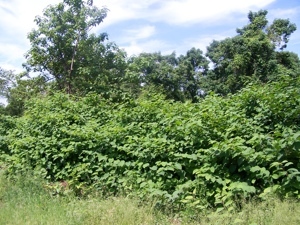 Groundnut vines, also growing on the same site, strangle the knotweed, killing many plants. So I had this brilliant idea to substitute rhubarb with knot-weed the other day for a strawberry – knot-weed spring desert…you got me! Hello, and thanks for the great article. I am wondering at what stage the stalks become inedible. Can you eat the stalks after they are 2 feet tall, of just when they are small shoots? Yeah, they start getting pretty woody after around a foot tall. At two feet they’re pretty much unusable. Thanks! I was wondering about that as I was tearing it out of the ground. I suspected as much and, luckily, have never put it in the compost heap. Now, my attack will be on two fronts- I shall,also, cook it and drink the tisane for my arthritis. If you boil it at any stage, will it yield a drinkable liquor? And will that liquor/tea/tisane/tincture have the same health benefits as using just sprouts? It grows on my property & it is INDEED invasive….I’ve tried to rid myself of it but it just keeps growing…..I am at least thankful to find there is ONE redeeming quality to the hideous plant. I have been gathering and eating Japanese Knotweed (in France, as it happens) for three years. I tend to cook it up with orange juice and a little sugar and have it with raw oats and a little creme fraiche for breakfast. While certainly endorsing the benefits, I would add two notes of caution: first, in Europe at least, its pest status leads some landowners to spray with herbicide during the growing season. Always be sure that the early shoots you are gathering have not been sprayed. Second, knotweed is high in oxalic acid (as is rhubarb). If you have kidney function problems, it should be eaten in moderation. For beekeepers, oxalic acid is also useful in the battle against varroa infestation and experiments are going on into using the leaves in beehives as a natural defence against that pest. Thanks and keep harvesting ! Have you ever used knotweed in a juicer? It definitely grows in central virginia because it is taking over my garden and everything else it can. This plant can’t be bought. Find some. For god sake don’t plant it. It’s a US WIDE invasive. Can I eat the root of the plant also? Can I eat just the root and if so how do I prepare it. In the State Forest near where I live, I found a single clump of the red-flowering type of this plant, surrounded by Japanese Honeysuckle, Red Buckeyes, and Stinging Nettles. It was in early Fall, and I never would have found it if not for the conspicuous red bloom spikes. Something there is keeping it under control, since it has not spread in the eight years since I found it. Since it’s considered invasive, I’m going to see if I can dig it out and transplant it somewhere in my yard. I am in need of it’s medicinal benefits. Continual mowing will eventually deprive the roots of nourishment. Each year the new shoots are smaller and weaker. I leave a few small patches at the edge of the woods for food. is a wonderful plant if you don’t let it get out of control. The white flowers smell nice and the bees love them. I am learning how to cook and eat this plant. There are many uses for Japanese Knotweed and you can make nice crafts and fences out of it too! God is so awesome that He gave us so many cool plants! I would love to learn more uses for Japanese Knotweed so please share your thoughts! Sandy – Can’t find your article. Do you still have a copy? Thanks! It is indeed a noxious species, and is becoming a real problem in waterways and on roadsides, etc. The only way we managed to eradicate a patch in our yard was to wait until the ground was dry and hit it with Round Up continuously all spring and summer, for four or five years in a row. The Dept of Environment here is trying various methods to combat it but is not having much luck. It is true that any bit of the rhizome will start a new patch. We were told to dig down as far as 8 feet and to ensure no pieces of rhizome were left, seal in black garbage bags and leave them on pavement for a season or two, and then dispose of in the garbage. Unfortunately Round Up is banned here now so it is really out of control. The summer and autumn shoots are tough and straggly – but the spring shoots are tender and juicy! That’s why everyone talks about harvesting in spring – very tasty! Can it be cooked and then frozen to use throughout the year without losing medicinal benefits? Hi, I own land in upstate NY, with a creek on it, and there is lots of this plant growing along the creek; the local farmer that rents our field has plowed it under for years to keep it at bay, but it is on both sides of the creek in abundance. I used to hate it, but now love it. I started bee keeping with my children four years ago. We moved our hives up to this track of land during the fall bloom and the honeybees loved it. They produced a record amount of dark honey. They made 60 – 100 lbs. of honey per hive in two weeks time. We had three of our super hives (7 – 8 box hives) draw almost 400 lbs. of honey each. It took three strong men, all they could do to lift the hives back onto the trailer, to take them back home. I haven’t tried eating the plant, but thought the post about the oxalic acid was interesting, as we use that to kill the Vero mites. We will take the bees to this parcel of land earlier this year to reap the full benefit of this plant. Anybody who is bothered by this plant on their land, should consider getting honeybees. It would be a sweet alternative to killing this plant. all wild plants are edible, some only once. https://www.epa.gov/minimum-risk-pesticides/what-pesticide . Furthermore, there are aquatically approved herbicides that might be applied to waterways, such as Aquamaster (an aquatically approved formulation of glyphosate), or Habitat (an aquatically approved formulation of imazapyr). So collecting by waterways does not in any way guarantee that the plants you collect from are not treated, and it behooves you to know the history of the patch you’re collecting from. Please don’t spread this thing around. It eats stream beds for lunch, and wipes out many native fish populations, including salmon. 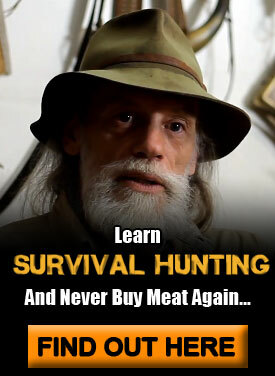 Like eating native stuff? Salmon is way better for you than knotweed. And salmon belongs here. Knotweed doesn’t. I first noticed this unusual plant over 25 years ago in Ketchikan AK. Having been a life long Alaskan, I had never seen it before and was curious about it. Well 15 years after first seeing it, I know what it is. It has invaded everywhere! It’s unbelievable is in town and way back in the woods. It’s here too stay. There’s no hope of it being destroyed. 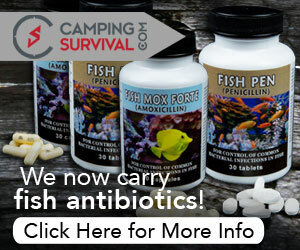 It can choke out salmon berries. This thing is an imortal, great Goliath.